kind of a hacky solution but you could configure the chat to be output as "message <user>"
Admins, OPerators and Moderators are 3 of the roles I have in my Discord. The TP command can only be used via those with the 'Admins' role and the other can be used by only those 3 stated. I can't get Minecolonies to recognize the bot as an OP who can make commands. All I keep getting is "You do not have permission to use this command"
I tried to add "Bots" to my roles list - as that's where the server bot's role lies.. but it's still not accepting the command. For myself, in Discord, I have my role set as @Moderator - should I include that in your roles block? My server automatically backs up so my discord gets spammed: "[CMD] [Server] executed save-all"
To everyone commenting in here having issues with the configuration of DiscordIntegration, I'm sorry. The config file was made with opportunities for really advanced setups in mind and in the progress I clearly added some weird behavior (discord channel IDs having to be strings one place and numbers another). This just made it extremely hard for people to even just getting the mod to work. Sadly I have been extremely busy in my personal life as you can read over here where I asked for help with updating the mod, as I had a new (hopefully) simpler config in my thoughts. I also just added a quickstart config on the wiki page here that I hope will help a lot of people getting the mod up and running quick and then let you be able to expand with the rest of the features over time. Again, I'm so sorry about your frustrations and I'm trying to get stuff fixed with the help of people that are kind enough to lend a hand. To me either noting works, or the chat only works in 1 way, but i cannot get it to work properly in any way. I have literally wasted like 5 hours on this already and it is really starting to piss me off. I touched noting except from the channels and token which i gave the " when nessesairy as on those screenshots when you scroll down a little bit and the JSON is valid but it says that it ain't on startup. I agree either this mod or it's instructions is not updated to CURRENT Discord standards. As it's current instructions is confusing me. I am dumping this mod until the Author chimes in to tell us how to exactly use with it the new Discord standards. The screenshots I posted below will allow you to set up the mod and have it working. I know it works, because it's working for me right now. If you still can't manage it with pictures, here's a working config. 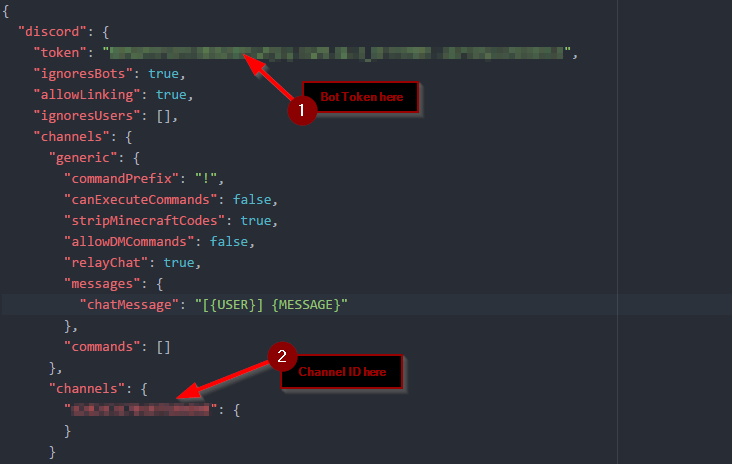 Post your token and channel ID in the indicated spots. Change nothing else. So I just take this config and rename it as what? Because when I load the mod it only generated two .json files. Im bad at this, how do i disable BOT saying what commands were executed by who? Under "minecraft", "dimensions", "generic"; set "relayCommands" to false and it should stop showing [Server] excecuted random command. I'm not sure what I'm doing wrong. Pastebin of my config file. Kind of confusing where the channel ID is supposed to work. The wiki says channel and I only see channels listed as options. could you please send it in paste.bin ? Config I mean. Thanks for this. It seems the default config is missing some brackets, or has them in the wrong places or something of that nature. Or at least that was the only difference I saw when I compared your file to the one I had freshly downloaded. Yours worked, though. Yay!